The best time to go to Thailand is during the dry season that stretches roughly from November until April. Unsurprisingly, this is, unfortunately, the country's busiest time as well, as masses of visitors arrive to take advantage of dry weather between monsoon seasons. Depending on where you happen to be, rain during Thailand's monsoon season can be as nondisruptive as an afternoon shower to cool things down. On the other hand, some storms can rage for days and cause flooding in some areas. Rain pops up unexpectedly even during Thailand's dry season, and you'll still find plenty of places to visit during the monsoon months. A benefit of traveling during Thailand's low season is that you'll have to fight fewer crowds and can get better deals on accommodation in popular destinations. The best time to visit Bangkok will partially depend on what sites you're hoping to see. In general, May through November is a great time to visit due to minimal rainfall—this season falls on the shoulder season of the wet months. In general, December through February are the coldest months with lower humidity. Bangkok is typically scorching hot throughout the year; you'll want loose-fitting clothing made from breathable materials and open shoes such as flip-flops. Thunderstorms pop up in afternoons during the wet season, sometimes flooding the streets. 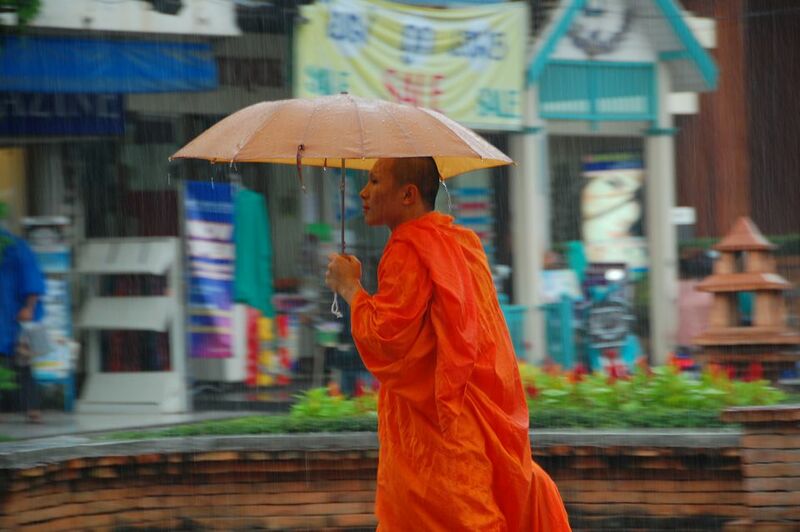 September is typically the wettest month in Bangkok. Low areas around Bangkok near the Chao Phraya River are prone to flooding during very wet monsoon seasons, while the pollution in Bangkok keeps humidity very high year round. Chiang Mai experiences pleasant, mild weather from November through mid-February, making it among the best times to visit. Not surprisingly, this season is peak tourist season, so you can expect more crowds and higher prices for hotels, but the weather makes it worth the extra hassle. Temperatures can dip into below 70 degrees Fahrenheit at night in Chiang Mai during fall and even lower later on during the year. Although Chiang Mai is relatively cooler and milder than the rest of the country thanks to the elevation, pollution from the city's traffic traps humidity during the hot months of March and April. Dust and uncontrolled fires cause poor air quality in March and April around Chiang Mai and Northern Thailand. The fires are an annual event that the government has not been able to control. People with asthma or allergies to smoke or dust will be better off visiting at a different time of year, perhaps during the rainy season when the air is cleaner. The weather in the Thai islands is affected by more than just the time of year; storms at sea can bring rain even during the dry months. Rain begins around April and tapers off in October on the west coast for islands in the Andaman Sea such as Koh Lanta and Phuket. The islands such as Koh Tao and Koh Phangan in the Gulf of Thailand see the most rain between October and January. Some islands such as Koh Lanta practically close down during the monsoon season. While you'll still be able to arrange transportation there, your eating and accommodation choices could be very limited. Temperatures in January and February are pleasantly warm, but then climb to scorching hot around the end of April just before the monsoon begins. The monsoon rains start around May or the beginning of June and run until November. Traveling during the monsoon season is hit or miss, but you'll be able to enjoy some places in Thailand with little rain or only occasional thunderstorms. The north of Thailand typically receives less rain than the south during the monsoon season. The Christmas and New Year holidays tend to attract large crowds to Bangkok, then the busy season climbs steadily from January onward. Chinese New Year (which takes place in January or February) is another busy time as many people travel to Thailand for the 15-day holiday. An unofficial busy season hits the islands in Thailand around June as many university students from Europe and Australia head out to party on islands such as Koh Tao, Koh Phangan, and Koh Phi Phi. The islands quiet down again slightly after the students finish their summer breaks. The largest festivals in Thailand tend to make accommodation prices skyrocket, and transportation fills up before and after the celebration. Chiang Mai is the epicenter for Songkran, the Thai new year and water festival, a big event celebrated April 13 to 15. Accommodation and transportation are entirely booked both before and immediately following the festival. The Haad Rin area of Koh Phangan in the Gulf of Thailand attracts enormous crowds of revelers each month bound for the famous Full Moon Party; accommodation around Haad Rin hits maximum capacity. Be sure to plan your visit around the Full Moon Party dates. The Loi Krathong and Yi Peng festivals (dates change; usually in November) attract considerable crowds to Chiang Mai; transportation gets completely bogged down. Asia is among the hottest months in Thailand, but it's also quite dry. Expect large crowds in most tourists attractions, as well as higher prices. Songkran, the traditional Thai New Year's holiday, takes place on April 13. It's trademarked by a huge water fight in the streets—a great way to cool off. If you don't mind rain and heat, you might be able to find a deal by visiting Thailand during the summer. In Chiang Mai, monsoon peaks in August, while in Bangkok temperatures can exceed 100 degrees Fahrenheit. Still, summer is a popular time for university students to visit the islands. The Amazing Thailand Grand Sale takes place each summer and is sponsored by the country's tourism authority. Stores slash prices by more than 80 percent. The Queen’s Birthday is August 12, which also serves as Mother’s Day in Thailand. A candlelight ceremony is held in the evening. Fall in Thailand can be quite wet, but crowds are less, temperatures are a bit cooler, and low-season discounts can make a trip more affordable. Beware that fall flooding continues to be an issue in most cities! During Loi Krathong and Yi Peng fire-powered lanterns are released into the sky in Chiang Mai. Visit the bizarre Phuket Vegetarian Festival in September. The unique event is actually part of the Taoist Nine Emperor Gods Festival. As monsoon season moves on, the crowds move in. Winter is a great time to visit, but expect more crowds and higher prices throughout the country. December 5 is the King of Thailand’s Birthday, which is celebrated throughout the country. Don't miss the Christmas Full-Moon Party at Haad Rin on the island of Koh Phangan.